Large Black and Gold Back Lit Glass "Westminster" Wall Clock 120 cm Diameter. This very large wall clock requires plenty of space and is a real statement piece. The opaque glass white face features gold roman numerals and hands with an antiqued black metal frame. 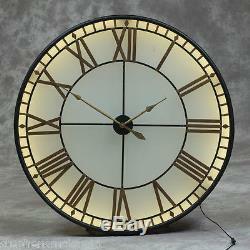 Back lit with a lamp style cord, this fabulous clock is a great piece of interior decor and a guaranteed head turner. The impressive dimensions are: 120 cm Diameter x 10cm Deep. Customers in the Highlands and Islands please check for a courier quote prior to ordering. Please read the following carefully. Deliveries between Monday & Friday before 6pm. This ensures that all items are sent in an immaculate condition. The driver will be available for ten minutes so you can unwrap and inspect the item for damages. You will be required to sign for your item and we cannot accept liability for unchecked items. Please note: Our drivers are not expected to carry heavy items upstairs. If you have ordered a large or heavy item, please ask somebody to be available to help you. It is the buyers' responsibility to organise and pay for the cost of return. Both the item and the packaging must be received back undamaged and in a pristine / re-saleable condition. The item "Large Black and Gold Back Lit Glass Westminster Wall Clock 120 cm Diameter" is in sale since Wednesday, January 25, 2017. This item is in the category "Home, Furniture & DIY\Clocks\Wall Clocks". The seller is "stephensmckay11" and is located in Brightlingsea. This item can be shipped to United Kingdom.